To experience bleeding of the gums every so often is not uncommon, and it can be difficult to know when and if you need to worry if it does occur. While bleeding gums can be a sign of gum disease - which should be attended to as soon as it is recognized - it might also be attributed to some less concerning lifestyle habits. 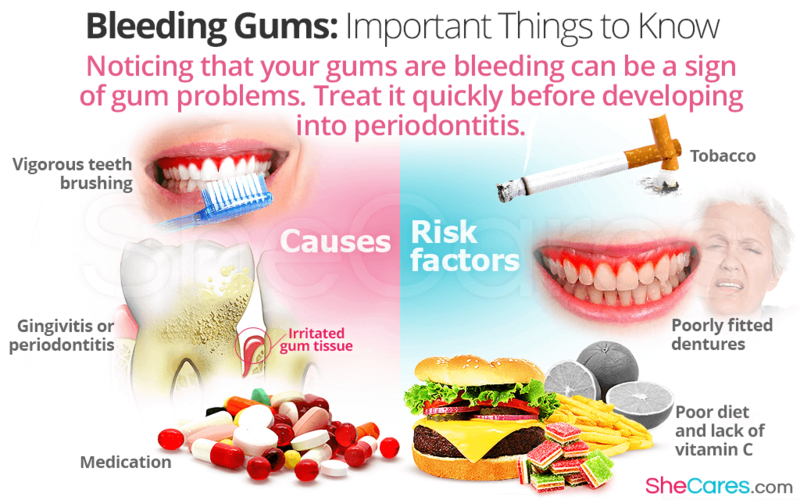 Read on to find out more about this condition, and some of the causes of bleeding gums. Bleeding gums are most likely to become apparent when brushing or flossing the teeth, and so a condition can often go unnoticed for some time unless you see evidence of blood when you spit. Usually the amount of blood is fairly minimal; however, in some cases it is possible to find that your gums are bleeding a substantial amount. This can be alarming, especially if it comes on suddenly, and so it is advisable to learn about some of the causes and triggering factors of bleeding gums. Vigorous teeth brushing or flossing. Sometimes using a hard-bristled toothbrush, or rushing with floss, can cause injury to your gums which may lead to bleeding. Take time and care and consider a softer brush. Gingivitis or periodontitis. Gum disease occurs when bacteria in plaque is not properly and regularly cleaned away, and can cause an infection which leads to bleeding. An early gum infection is known as gingivitis, and if it is allowed to worsen it can develop into periodontitis. Medication. It is known that some drugs can lead to bleeding gums, including blood thinners and medication for diabetes. If you believe pills could be the reason behind your bleeding gums, talk to your doctor to discuss alternative treatments. Tobacco. Smoking, or using chewing tobacco can irritate the mouth, and so if you have even a mild gum infection or sore gums, this can often worsen the condition. Poor diet. The body needs vitamin C to maintain strong tissues, therefore if you have a deficiency in this vitamin it is likely that your gums will become more vulnerable to infections, as well as bleeding caused by other factors. Poorly fitted dentures. As we grow older our bodily tissues become weaker naturally - this includes the gums. This means that poorly fitted dentures might cause scratches or ulcers, which are likely to bleed. If you notice blood in your spit when brushing your teeth, it is important to consider all the possible causes. It should be reassuring to know that with some knowledge about the reasons and triggering factors, it should be possible to treat bleeding quickly, if not avoid it altogether.